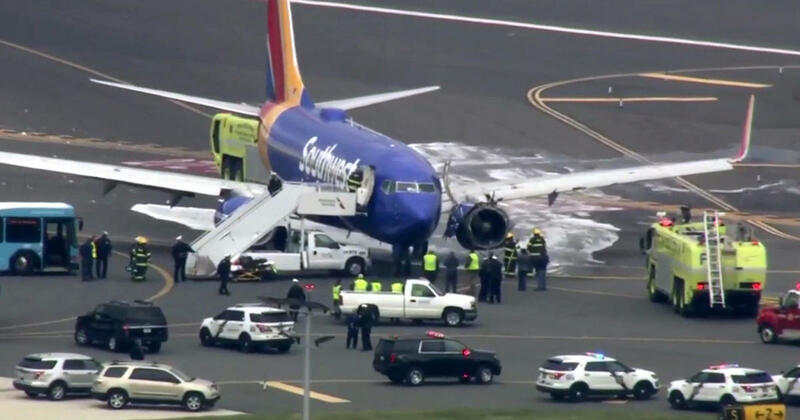 PHILADELPHIA — A Southwest Airlines jet made an emergency landing at Philadelphia’s airport Tuesday with part of the covering from its left engine ripped off and a window damaged. Neither the airline nor the Federal Aviation Administration explained what went wrong. Passenger Marty Martinez told CBSN from the plane that a woman was injured and was taken off the plane. “There was blood everywhere,” Martinez told CBSN’s Anne-Marie Green. Details on the passenger’s condition weren’t immediately available. 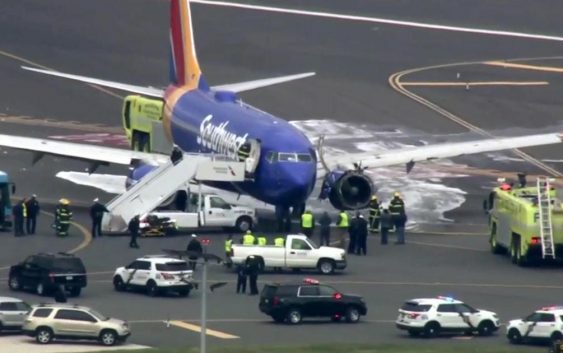 Southwest said there were 143 passengers and five crew members onboard the Boeing 737, which was headed from New York’s LaGuardia Airport to Dallas’ Love Field. Passengers were seen walking off the plane onto the tarmac at the airport after landing around 11:20 a.m. The Philadelphia airport tweeted that Flight 1380 “landed safely at PHL and passengers are being brought into the terminal.” The airport said flights were continuing to depart from Philadelphia and that the FAA had lifted a ground stop for planes at other airports waiting to depart for Philadelphia. The FAA said that the plane landed after the crew reported damage to one of the plane’s engines, along with the fuselage and at least one window. Southwest has about 700 planes, all of them 737s, including more than 500 737-700s like the one involved in Tuesday’s emergency landing. It is the world’s largest operator of the 737. The Boeing 737 is the best-selling jetliner in the world and has a good safety record. Investigators are likely to take apart the failed engine from Tuesday’s plane and examine maintenance records as they try to piece together the cause of the explosion. CBS News transportation correspondent Kris Van Cleave reports the flight was powered by CFM engines. An official told CBS News that CFM has sent representatives to the scene to support the investigation.